One chapter in The House Enters the Street is a one-act play titled “Stone Soup,” in which a varied group of soldiers and townspeople spice a cauldron of water and stones with all manner of flavors, like cocoa, parmesan, pickle, horseradish, persimmon—and of course, the finished soup is delicious. So it is with this odd, textured, seemingly incongruous brew of—what to call these? Chapters? Stories? Ruminations? Threads of loosely connected plots weave their way through the text, creating an abstract of the different generations of a family that immigrated to Iowa from Scandinavia, each struggling to find identity and purpose: Faar and Mor, neophytes in the plains that are so full of promise and struggle; Eva, Una and Holde, their triplets who become twins; to Isabel; to Avra; to Carrie. Another writer would chronicle these characters in a family saga devoted to “making it” in America, but Henderson’s book is concerned more—thankfully—with the value of family and the self within that context. Underlying the narrative is a book, The Street Enters the House, given to Avra by the proprietor of an aptly named shop, Books Within Books. Avra is a modern descendant of the family line, whose husband died in a terrible fire in which she lost the fingers of one hand and had them replaced with two of her toes, ending a promising career in music. 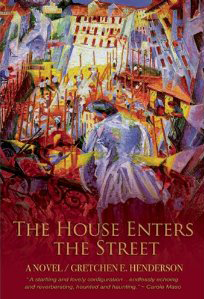 The dense collection—parts of which take up long passages in this novel, including the play noted above—haunts and infatuates Avra, and provides further connection to a painting—an actual painting finished in 1911 by the Italian Futurist Umberto Boccioni—which is the artistic inspiration for the book. In the painting, a version of which serves as the novel’s cover, a woman looks out over her balcony as a cacophony of life’s activities make their way to her front door. In The House Enters the Street, however, the concept is reversed—we must go out into the world to properly experience it, and for Avra, so restricted by the physical tortures of her recovery, each moment seems a rediscovery of lost feeling and memory, a reintroduction to the worlds of music and art she was forced to abandon. The book maintains this masterful ekphrasis throughout, translating one genre of art into another, to praise and reinterpret. Henderson draws on her experiences as musician and historian to fill the novel with the nuances of a staggering array of artistic disciplines. The language in this book, even the font styles, reflects the voice behind each thread. Basic, straightforward narrative relates Faar’s immigration tale. Successive generations live through increasingly complex, poetic tellings. In places, the “Famuli Tuorum” chapters take on the inventiveness of a language poet. Excerpts from The Street Enters the House are printed in screened type, as though the book within the book is something less than fully real. Like the Boccioni painting, The House Enters the Street is a dreamscape of images, the beauty and chaos of modern life, although it occasionally wants to notice too much, and takes its sensory devotion to extremes, rattling off lists of sights and sounds and museum displays, a spectacular collection that will thrill Art History majors, but may leave others logging too much Google time or perhaps skipping sections. Confused? This is not a book for bedtime, which is only to say the narrative invokes the reader’s senses to such a degree that wide awake is the only state in which one should dare approach this novel. Henderson’s imagination and her ponderous intelligence intrigue, but can sometimes intimidate. To her credit, she has not sacrificed her vision for the sake of mass accessibility, choosing instead to challenge readers to indulge in her world. Joe Ponepinto spent the first half of his life in a variety of mercenary pursuits. To make up for it, he now writes, edits or teaches every day. He is the Book Review Editor for the Los Angeles Review, and has been published in a variety of literary journals, most recently Passager, Fiction Southeast, Prime Mincer, and Connotation Press. A New York native, he currently lives in Michigan with his wife, Dona, and Henry, the coffee drinking dog. His blog on writing and criticism is at http://joeponepinto.com.